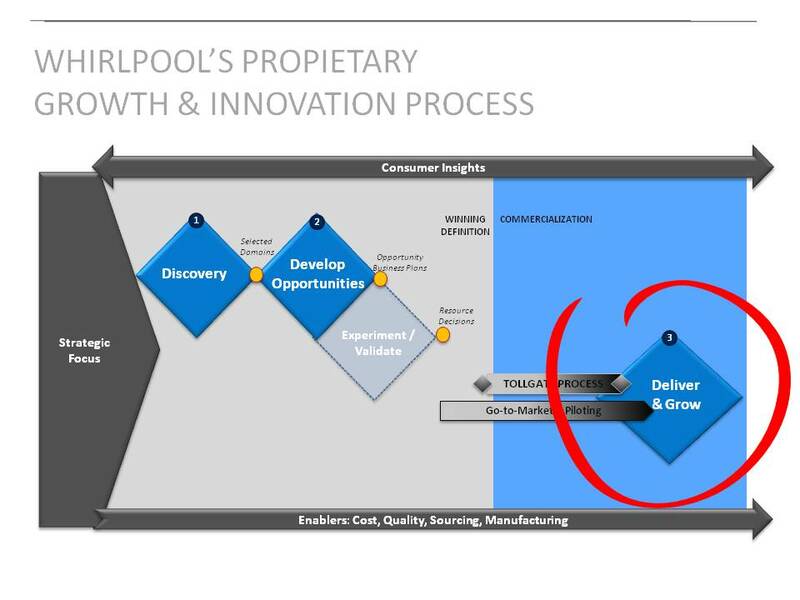 Whirlpool Corporation recently added the “bow” to the rock-solid and deeply embedded Double Diamond process which focuses on discovery and development of new opportunities in the front end. The Third Diamond is its newest addition, and Whirlpool is currently at the beginning of its scaling phase. This phase was created with one objective in mind: maximize the value extraction of our innovations in the marketplace. This process has helped us think differently and is the perfect right-left brain combination, balancing the creative principles of innovation with the disciplined and structured marketplace management competency. Whirlpool Corporation, the global leader in home appliances, has a 10-year history driving innovation, applying the double diamond process. This process, along with an explicit effort of embedment and operationalization, has resulted in the transformation of the organization and the generation of an innovation pipeline of about $20 billion. Whirlpool is turbo-charging innovation in 2011. One key element of this initiative is the creation of the final leg of the innovation process: the Third Diamond. This new phase is intended to help the organization find ways to maximize the value extraction of our innovations in the marketplace. We’ve had a strong focus on generating innovations, when they get introduced into the marketplace, they are managed by business teams that deal with multiple categories and products, and those innovations at times become part of “the line”. 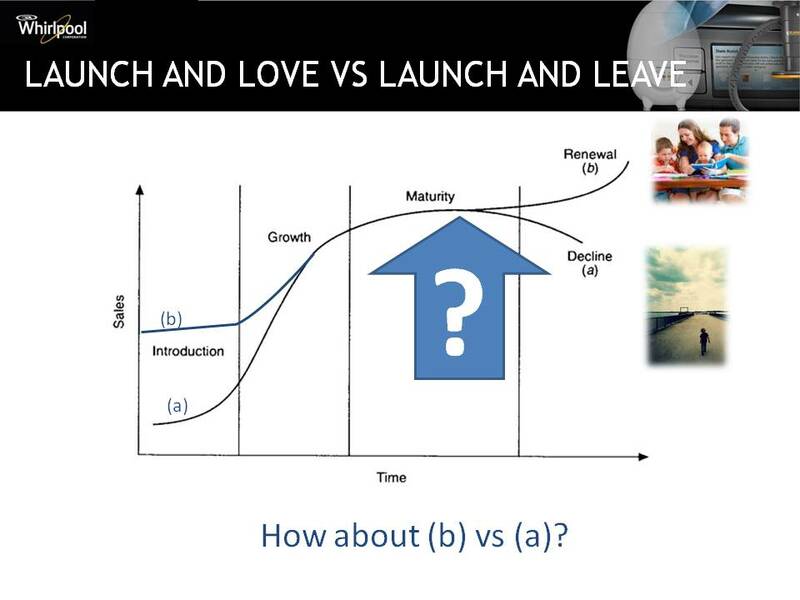 This process is intended to reinforce the tendency from “launch and leave” to “launch and love.” In other words, mature and grow the launch rather than managing innovation as “any other” product, applying the mentality is to keep “turning rocks” in search of value by applying this process. Innovation and marketplace performance (or Price Margin Realization as referred to later in this article) are applied as two separate and mutually exclusive disciplines – innovation is the creative process that finds and develops new ideas while marketplace performance manages via hard metrics and left brain thinking. This approach has occasionally driven what could be considered premature decisions to replace good products too quickly before exploring go-to-market alternatives that could make them successful. The easy thing to do in a company used to dealing with product is to ask for product solutions when something is not working when there are in fact, other ways to extract value from the investment. More than anything, we needed to make this a way of thinking for everyone. Many of Whirlpool Corporation’s innovation projects had been launched to address early hypotheses and learnings. As these launches faced challenges in the marketplace, some areas of the organization tended to apply traditional marketing tactics to drive performance. Some post-launch audits exposed gaps between innovation business plans and actual marketplace results. In these cases what we heard was: “this didn’t sell according to expectations” and move on to the next thing. Most of these innovations addressed real unmet consumer needs and consumer pain points. Experimentation is a key ingredient of innovation, but is often misunderstood. It is easy to confuse it with market research or expect that the experiments will prove the financial viability of innovation when in fact, they are intended for learning. “We need to promote” – consumers need to be converted. When it comes to innovation (and even for non-innovations) we know that success doesn’t necessarily depend on these factors. How can the organization then be encouraged to “keep turning rocks” in search for value extraction? My team was charged with finding the answer for that. The only thing we knew was that while this process may identify product opportunities, the focus was on the go-to-market. Several factors influenced our approach to go after this opportunity; not only that, we had to align many heads around this abstract concept before we could actually start the work. The first decision that we made was to make this bullet proof. We would not do it in “the lab,” instead we would use a real project and run it as a pilot, and we would do this in what can be considered Whirlpool Corporation’s “bread and butter”. While a recent innovation in the laundry business would not seem a logical choice for a project like this as it would be harder to break new ground in a known territory, this choice would challenge every orthodoxy we have and deal with the complexity of a mature and robust business. While we have a mature process and people that drive it day in and day out, it would have been hard to bring a team that would challenge our structure and processes deep enough to make implementation recommendations that would not impact their day-to-day; therefore, we decided to bring the firm that helped us introduce the double diamond in 2001 back to help in this endeavor. This decision would also assure the process was consistent with the innovation principles of the double diamond process they brought in the first place. Our Corporate Vice President of Strategic Competencies, Nancy Tennant, challenged our initial drafts of the pilot. She had the vision that the place in which this phase would operate would require close interaction of the innovation competency with the marketplace management -one we call PMR (Price and Margin Realization). This required deep thinking and charter iterations to integrate core elements of this left brain discipline with the principles of innovation. Our last decision to make was who to assign to lead the project. While all set-up and conceptualization had been done by our group, Whirlpool University, it was necessary to assign business leads to make it relevant for the business. Ken Whah, fabric care business lead and Mohit Jain, PMR director for North America embraced the idea, made adjustments to the plan and presented the project to the 50 top leaders during our annual leadership conference in Chicago. The choices made proved to be the right ones, but working in a 100 year old category came with its challenges. Leaders and middle management seemed to agree with the concept of “maximizing value extraction”, but challenging established processes and conflicting priorities came as part of the challenge. With some exceptions, the cross-functional team did not report directly into the business unit. It was defined this way so we could gain insight and be able to impact the whole value chain. The team members were expected to give 20% of their time. And, it turned out that some put way more than that while others faced challenges to keep this commitment and balancing their priorities, demonstrating the role that leadership alignment and air cover continues to be an essential ingredient in innovation. One of the things we quickly uncovered was the “we already know that” syndrome, the process allowed us to discover tacit knowledge of things we tried in the past and market knowledge/wisdom. The process combined with Whirlpool’s values of teamwork, respect, diversity and collaboration were important success factors. The team then moved into ideation based on a total immersion, engaging the challenges, the new learnings and calibrating their discovery with tacit knowledge. Managing an existing, large scale business brought challenges that every established organization will likely face. Going after new knowledge in search for opportunities of an established business started to crossover in people’s “sandboxes”. The trade-offs that some teams would have to make are hard to balance with the day-to-day operations of an established business. 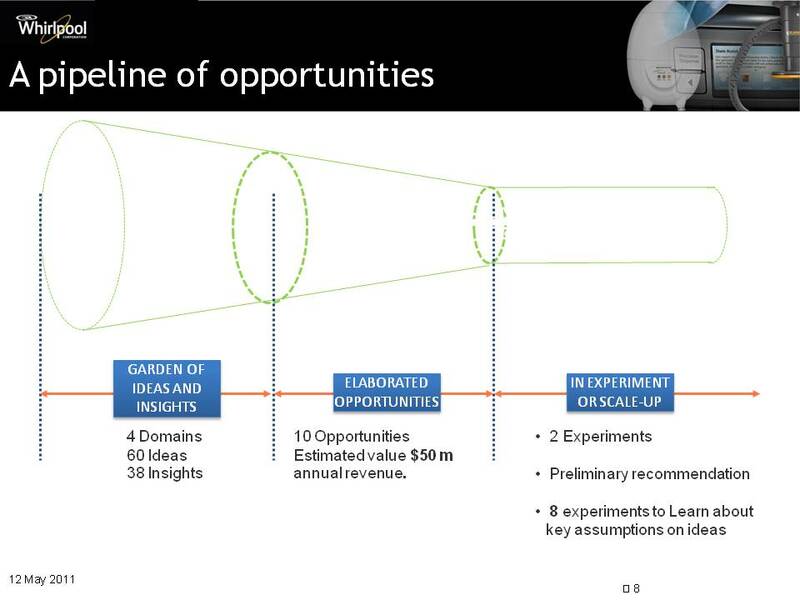 This begs a need for openness about learning and experimentation as it is not intended to challenge initiatives or decisions made in the past, but to explore upside opportunities in a learning organization. The “bow” of our innovation process is now documented in the proprietary Growth and Innovation playbook that contains the principles and tools that are necessary to replicate this process. As with “normal” innovation projects, successfully executing an initiative also requires the right level of expertise. One of the big findings was that this process has applications beyond the way it was originally conceived. Not only can Third Diamond be applied as a post-launch effort, it can create value in other instances. The first one is the application after a concept has been locked in our stage-gate process. This applies particularly well for projects that didn’t go through the innovation process (i.e. cost/quality initiatives) or for innovations that require innovative go-to-market approaches not conceived during the front-end process. Another potential application of the process is just before the launch when significant disruptions in the marketplace put our original assumptions at risk. These two applications have been embedded in our product development process. One of the biggest challenges in the creation of a process like this is the scale-up phase and operationalization. Processes like this require the right level of demand from the business and push from leadership. While the business benefits are evident, organizations are tight in resources and have a tendency to focus on established mechanisms – doing something new that requires setting time aside requires a significant behavioral change, so some push from leadership is required to grab the attention of business leaders and executors. At the same time, there’s got to be a good balance of value-added activities to keep the focus and attention of a team. Crossover in people’s sandboxes: Since this project was dealing with an existing business, every conceived experiment would offer a different approach of doing something someone is responsible for. This caused questions and reactions, to the point that in some cases the experiments were challenged. The reaction of those in charge is understandable and is a reflection of Whirlpool's spirit of winning - everyone wants to do the best job possible. The solution to this is a cultural change that can’t happen overnight, but having the right people involved in experiment planning provides the right context and converts people into supporters. Experimentation vs. market research: Our organization is used to dealing with validation of our concepts, testing them for quality assurance and consumer acceptance. It is second nature. The notion of experimentation challenged this thinking. On-going debates of the differences between these two led to the creation of guidelines to conduct experimentation. These guidelines allow teams to recognize the boundaries between these two and make the right decisions depending on their needs. As we said, experimentation is an AND not an INSTEAD of. As described above, this project started as a pilot. It required the chartering process, negotiations with leaders, resource assignment, etc. With a lot of “air cover” and leadership drive, the project team delivered a number of ideas. Many of these ideas required some level of investment that the team had not planned on. This represents an issue if “Third Diamond” becomes an activity that is started outside the business cycle. To alleviate this challenge, we have engrained the process into our Long Range Planning process. This way the team will identify which initiatives require a Third Diamond effort on time to plan for the necessary resources to drive the ideas that emerge from it. While it was challenging at times the rewards of this effort were significant with both tangible and intangible results. From a business perspective, the team generated 38 new insights and 300+ ideas. Once filtered, they turned into 60 implementable concepts organized in four domains. The ideas were prioritized and a portfolio of 10 opportunities was selected for development. The selection criteria were business potential, execution timeframe and closeness to the core. The intention was to create a balanced portfolio of opportunities. The 10 opportunities developed represented ~$50 million of incremental annual revenue for the fabric care category. One particular benefit I relate to my experience in the business operations, is that the rich insights and ideas generated by this process can be extremely useful for category and sales managers as they go through the Sales and Operations process. These weekly, monthly and quarterly “gap-closure” meetings are intense and demanding – category and sales managers are asked to find initiatives that close the business gaps when they arise. This is no easy task and the levers to pull from are very common: a consumer promotion, a trade incentive, a temporary price reduction, a “drop-in” model in some situations. While all of these bring good business if planned and executed with PMR discipline, having the “garden” of insights and ideas gives the managers more levers and insight substantiation for their actions in search for business upside. The intangible benefits were also significant. While it would be hard to associate a financial figure with them, they have been invaluable to the team. In some way, all of the team members’ daily responsibility is related to some business aspect of this category. Having the team go through the process created a common platform to work from. The team members all know what the issues and opportunities are. Having given the team the opportunity to experience the customer, trade and competitive pain first-hand created a common consumer language among the team members and a sense of empathy with the consumer. In a post-project focus group they all shared that the insights found during the project have become common language for the team – not only can they come up with solutions that address the insights but they can quickly rally the team around the solutions as they all understand it and believe in it the same way. Finally, this process gave the team the opportunity to dream about the possibilities that exist in the business. Through the migration paths these dreams were turned into particular initiatives. But when a dream exists, there is a sense of aspiration that is hard to generate in the S&O process. There is no magic that creates innovation. There is no magic wand. Innovation is hard work. The success of an innovation initiative is the result of an applied process, of the right combination of tools and techniques, of bringing together a diverse group and giving them a common goal and the bandwidth to execute the projects. It is also the result of the right leadership support and “air cover”. When all these elements come together, one could argue that magic can happen. It is great to see how the big and established companies are able to innovate in the same way that an startup, the Whirlpool Innovation process bring the expertise of people from any are of the company to develop new innovative ideas that become into great business units. This process shows how large organization are able to motivate the people to be open for new endeavors, take risks, fell interest to do new things despite the risk of failure, making failure a learning experience to pivot back the learning situations to experiment again until find that it is a good opportunity or have enough evidence that there is not a chance to win in a specific situation. I found a parallel situations to the way that entrepreneurs develop new startups using the Eric Ries and Steve Blank concept of Lean Startup, where it is important to discover a need, find the solution/market fit by holding a continuous feedback loop to learn that the opportunity meet a need in the market, that is worthwhile to pursue. I congratulate you Moises, for sharing these set of point to explore their use and value outside of Whirlpool. It will help hundreds of people to build value and find how to improve our global economy. Moisés, I really enjoyed this article and the model of the third diamond itself. What poped up to my mind when reading about Business Unit sales forces is: Innovative products are being sales such as regular products? If the product development is involved by innovative processes, has the sales forces the same innovative processes or innovation is only for product development? Moises, What a story! Granted Whirlpool has done some great things in innovation - innovating & process, but this is a superbe example of an area that is usually ignored. Many times companies go through to launch but it ends there without the assessment, appraisal and vetting of the launch's success or failure to learn and apply. As you recognized, this is a big gap in innovation and it seems Whirlpool is continuing to change the culture to fix it. I also appreciate the distinction between experimentation and market research. Sometimes, that is a very difficult point to get across to folks - they assume if they do the market research, that's it but actually putting something into the market, albeit a 'test' market, is invaluable because we don't know how we are going to use something until we do - reality vs. theory. Kudu's! Great job and easy to use as a guide for others to follow.